Britain's Jamie Murray won two matches in one day to advance in the men's and mixed doubles at the US Open. He and Brazilian partner Bruno Soares beat Dutchmen Robin Haase and Matwe Middelkoop 7-6 (7-4) 6-4 to reach the last eight without dropping a set. Then he and American Bethanie Mattek Sands needed a match tie-break to beat Nadiia Kichenok and Wesley Koolhof 7-6 (7-5) 6-7 (6-8) 10-7 to advance to the semi-finals in the mixed. Briton Dom Inglot's run came to an end. Inglot and Croatian partner Franko Skugor saw their run in the men's doubles ended by American third seeds and Wimbledon champions Jack Sock and Mike Bryan, who won 6-2 6-4. 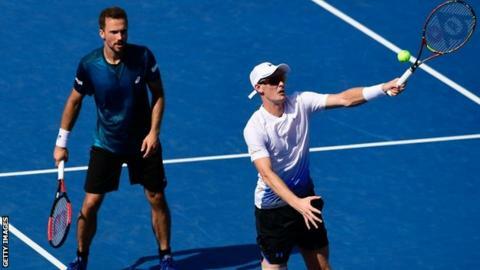 Fourth seeds Murray and Soares, who won the men's title in 2016, face unseeded Radu Albot of Moldova and Tunisia's Malek Jaziri in the last eight. The Scot's mixed doubles semi-final will be against either Americans Christina McHale and Christian Harrison or fifth seeds Andrea Sestini Hlavackova and Edouard Roger-Vasselin.